Now we spend the next four weeks carefully making sure no other children yank, tug, or trip on the tubes connected to Colten. Including Colten. It’s already a bit challenging and he’s tangled himself a couple times. He’s not super mobile yet which is good. I’m not sure how we’ll manage his “accessories” once he’s independently walking. Thankfully the older boys are out of the house most of next week (and they were the end of this past week too), and Sophia has been swooped up countless times by her Gaga (Grammy), Papa, and aunties – so all is usually good when it’s just me and Colten at home, or just Richard and Colten. A bit chaotic when we’re all here! Colten was so excited to be home finally and once we got settled in Thursday, wanted to go outside. Can you blame him after being cooped up for 2 1/2 weeks?! So we strolled the neighborhood a bit, collected sticks, and just enjoyed a relatively quiet evening. The home nurse came Friday afternoon just to check in on him. Most of the big medical stuff is done by 11am here – fighting over medication, struggling to get the injection done, bathroom time, etc… So we’ll just be lazing about. Ha. Ha. 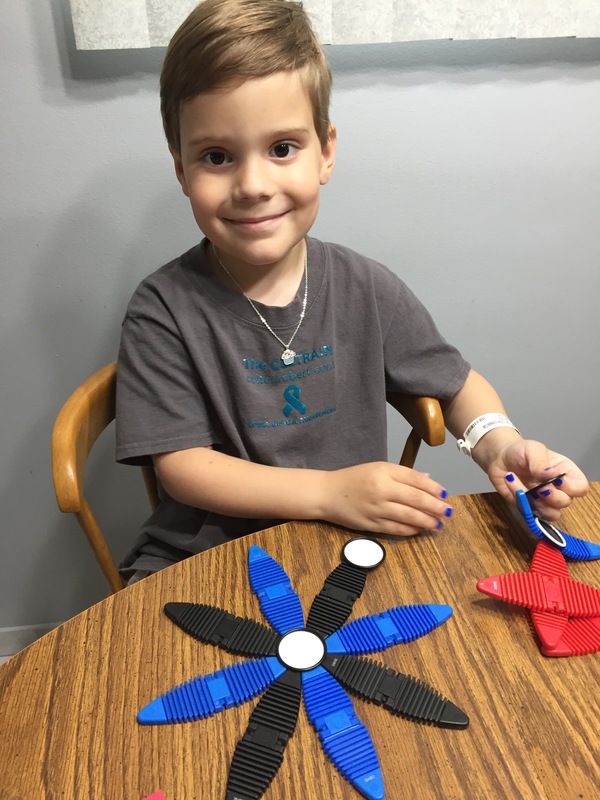 It’s nice to have him up at the table playing with stuff though – we are hoping that being at the table and not on the couch or in bed will help the alopecia on the back of his head start to resolve. 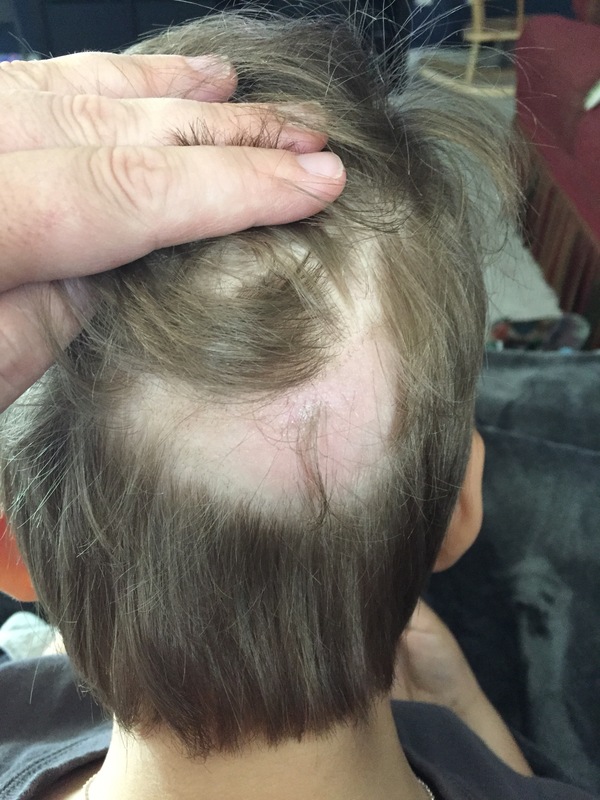 Due to the extensive time on his back with 13 hours of surgery and 13 more hours under sedation, then 2 more weeks laying around, he’s developed a temporary type of alopecia (hair loss) and has a huge bald spot on the back of his head! There’s not a ton to report or update on. Things are easier, in a sense, having him here. He’s doing better and it feels good to be home. But it is also a bit more complex. Any house with four kids ages eight and under (8, 6, 4, and almost 2) is chaotic enough. Add in that it’s summer, then add in that there is a child needing cautious movement, vigilant observation, and medical “stuff” done throughout the day… I think you can begin to imagine! For me, the daily resistance is hard. He takes medicine that he hates twice a day. Two different meds each morning and another in the evening. One of those he will be on for life. He puts up a fight EVERY. SINGLE. TIME. It’s mentally and emotionally exhausting for me. I know it’s tiring and aggravating for him. He’s actually always been a pretty good medicine-taker up until now. He takes small bits of each at a time, followed by swigs of lemonade (I’ve never given a child so much non-water to drink in a day!). And of course, we follow both medicines up with a small candy treat (I’ve also never given a child so much candy day after day!). The lemonade part is okay – he has to consume tons of liquids so it’s helping that he does that. But I’m really hoping we work towards not having to bribe so much with the oral medications over time. Then there’s more resistance with his injection for the blood clot. After two weeks of having nurses do these, and me hold his hands, and a couple times of me giving the shot and experienced nurses blocking him from grabbing at the needle or my hand, it’s now me giving the shot and Richard attempting to hold him back. Yesterday went okay but it is really hard to restrain your child when they’re yelling and screaming and you know you’re about to hurt them. Today was more rough. I thought I could have Richard not quite hold him down but just block him, but then I got so nervous that Colten would get through the block that I balked on the shot twice. I think it took us 10-15 minutes to get it done and I was spent after that. This afternoon I walked down to a neighbor’s house. She is a nurse and I asked if she would be okay coming to do the injection on morning’s she’s home. Even if I can get a break from some of the days, it might do us good. I just don’t think I can do this for four weeks. Richard seems to think he could do it, so we’ll probably have this nurse show him. Thankfully, I got some practice needles from the hospital so he can try it out and see. It’s draining and overwhelming. I won’t lie or sugar coat it. From about 8am-12pm, it feels like a spattering of medical stuff all morning. Then all day, staying on him to drink, drink, drink. Moving him, checking him, handling additional medical needs as the day goes on. Plus the rest of the kids, the house, life. At least in the hospital it was JUST US, and we had tons of medical people around if we needed help. People warned us before the surgery how much of a toll this surgery had on their families and lives, not just for the in-hospital portion but afterwards before phase two and during all the recovery. It’s hard to picture, and you certainly never know for sure because you don’t know what additional things you’ll encounter, but for sure, this is going to be difficult for a while. ​He needs to stay home for the most part. He can go places, but should avoid most public settings due to germs and the increased likelihood of an infection. He can go outside, but shouldn’t get wet (no sprinkler play, water gun fights, etc). So we are splitting the family here and there as needed and will continue to dole out gifts to him at home as needed when most of the family is gone for a special event. We had so many amazing friends and family send stuff to us, we didn’t even go through them all while at the hospital! 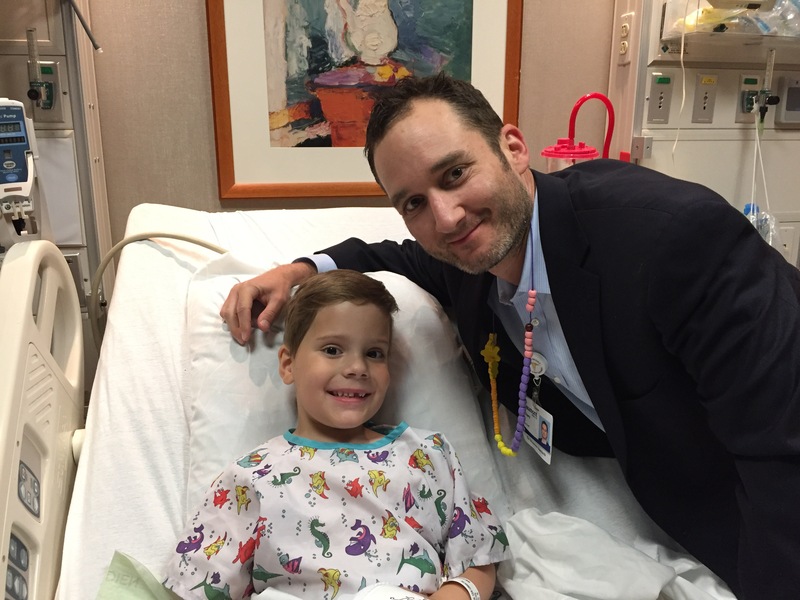 Major props to our urology surgeon, Dr. Zach Liss, with Michigan Institute of Urology! 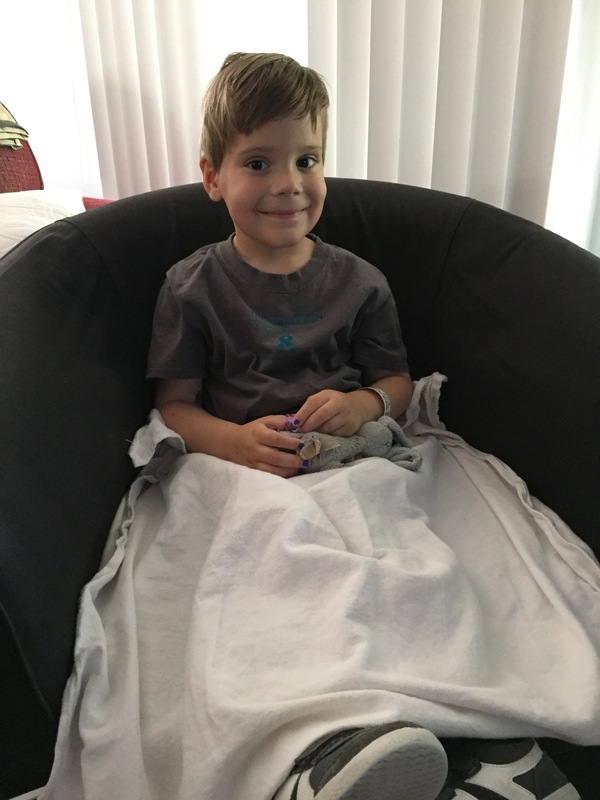 He’s the primary doc on this case and has seen Colten every single day in the hospital, sometimes twice a day (even on weekends and Father’s Day), and calls to check in on him 1-2x/day. Even now that we’re home, he texts or calls each day. His pre-op consultations with us were always thorough and personal – we ask a billion questions and it never phased him. Better yet, he’s retained a very fun, positive relationship with Colten, who hates all the pokes and pricks and prods Dr. Liss has to do to him! This phase of the surgery went better than we could have expected (minus the blood clot of course). We still have a long road at home and a follow up surgery in about a month. We highly and strongly recommend this man for anyone needing pediatric urology support. Dr. Liss – thank you! Good to hear the nurse down the street can help with injections. I’m so impressed with video – he’s walking. 🌹🌹🌹🌹🌹🍷🍷. Hugs to all of you. Mister “I’m Walkin!” has his momma’s beautiful eyes. Too amazing all of you !! “I walking” bless his heart.